A place to gather and commune about life. Is there ever enough time to get everything done? Most people would answer no to this question. I know my husband would. He works full time, is in school full time and maintains a web business. He's plenty busy and wishes there were more hours in a day. I feel the same way on most days but there are days where I purpose to slow down to a near halt! I think it's important to take a day here or there just to rest and reconnect. But when you have children to raise, you can't effectively put them off until that day comes and before you know it hours, days and weeks could potentially go by without feeling that you've connected to your children at all. It can leave you wondering about the type of mother your are. You begin to question if you're focused on the right things, if your priorities are out of order. You know you need to produce an income or tend to house or cover school subjects daily but after all of that's done you're left wondering where could you possibly fit in the emotional connection that your child needs. I've put together a list of ideas on how to make that emotional connection with your children on your busiest of days and how to schedule some time in to cash in big on "that loving feeling" of togetherness. Random and consistent I love yous. This is something that my husband and I say everyday to each other and to our children. It doesn't matter how busy you are, there is ALWAYS time for those three little words. I love you. I may be doing the dishes and one of them is a the table painting or doing schoolwork and I'll just say it, right there on the spot, no lead-in or specific reason. I love you. You CAN NOT overdo it on this one so don't wait til bedtime, say it at breakfast, say it at lunch, say it at dinner, say it as they walk past you to the bathroom. Also use their name when you say it, their nickname even...say it at least three times a day. You wont even have to stop what you're doing to let your child know that you love them. Your child will know that you love them no matter how busy you get. They will be firm in this most basic of needs that they have. Tight squeezy hugs. Now my kids are still young and are girls so they still allow me to hug them. In fact, boys this age will still appreciate a hug or two every now and then. I don't hug my children everyday but when I do, it's nice and tight and I linger. So take those rare moments that you have where you are just sitting and thinking about the next thing that you need to do to give a luscious hug that only you can give. My oldest calls it "mommy love". And because we don't get a chance to do it everyday, it's SUPER special and nice when we do have a moment to just sit there and hug each other. This one works for Daddies also. 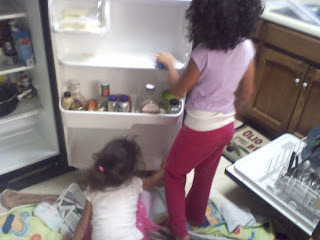 If you ever visit us, our girls may tell you all the things that they've "helped" daddy build or fix around the house. The list would sound something like this: the dining room table and chairs, their bunk beds, changing the dining room light bulbs, their bike tires, etc. etc. Of course, they will one day learn that holding a tool in hand does not equate to helping but those are special memories of spending time with daddy that they will always have. Exercise together. One of the things on my to do list that keeps me busy is exercise. It can take a gigantic chunk of my time and there have been many days that I was left feeling great physically but not complete emotionally as it related to time with the kids. As a resul,t this one has worked for me. On the days where I can exercise at home, they are right there with me going along with the Leslie Sansone dvd. Usually my exercise routine keeps me out of the house for two hours sometimes more on weekends (which should be prime family time right?) so when I can fit in a day at the house, I let them join in and they LOVE it. It also doesn't hurt that they are getting great exercise right along with mommy. The four of us have even jogged around our neighborhood together (its a quarter mile jog) again though, they LOVE it! Play games at dinner time. I started this one in our house a couple of years ago and the games were mostly educational, like the rhyming game. Someone would start the game with a word and we all would go around the table giving a different word that rhymed with the original word. Well, my 4 year old told me a few months ago that my games are boring and Daddy's games are fun because I (mommy) always want to work. Geesh! At any rate, they've come to expect and love a game at dinner time. I, at this point, could do without it, but for the sake of connecting with the kids in a busy world, I play. HI-LO. There are many variations of this game. Some call it roses and thorns or peaks and valleys. We called ours mountains and valleys for the longest time but then it became a colossal waist of time because the kids were not really telling us what happened in their day. So now, if they've gone somewhere without Daddy or me, whenever I have a moment with them, I'll ask, "what was your most favorite part about so and so's birthday party?" After they tell me cake and icecream, I ask, "what was your least favorite part" and that's when I find out that some boy hit her and didn't say he was sorry or that they did something that they were not supposed to and Nanna had to get on to them, etc. So the classic game, or some variation of the game, High and Low is a great way to connect with your child after you've spent time apart. Recognition and praise. Take two minutes of your time to recognize something that they've done. One day, I was listening to a video on the web and the girls came in with some My Little Pony stuff saying "free popcorn, get your free popcorn!" What did I do initially? I said, "give mommy just a few more minutes o.k?" And they gracefully turned to go out of the room, then I realized, I can pause this video, but this original, unadulterated moment, I can't. So I paused the video and got my free popcorn. It took all of 90 seconds to interact with them and recognize them in that moment. So when you can stop for a minute and a half...do. Notes in a lunchbox. Not just for a spouse, also works for kids. I home school now but when our oldest was in public school, on the first day I tucked a little note in her lunchbox that said, "I love you and you're doing great!" She saved it and now it's in her keepsake box. Set a specific night aside for family fun. We generally have a Friday Family Fun Night. During this time we do all the things you imagine, play games, put puzzles together, laugh, watch a movie, make a dessert, eat pizza, all of the things kids love. We've even completed a school project during this time. It's so much more fun when the whole family gets in on the project. You can have one night per week, every other Friday or once a month. Whatever works for you. Remember, its quality versus quantity. Bless them. At night after the story book story and after the Mommy or Daddy story we take the time to bless our children according to the scriptures. We just speak great things over them that are found in the Bible. Some nights after I've finished blessing them, Chelsea has reached out and grabbed me for a hug. What I think is happening when she does this is a level of understanding and grattitude that manifests itself as a loving hug. I honestly think that in that moment, she "gets" it and feels my love for her in the wonderful things that she's hearing being spoken over her. 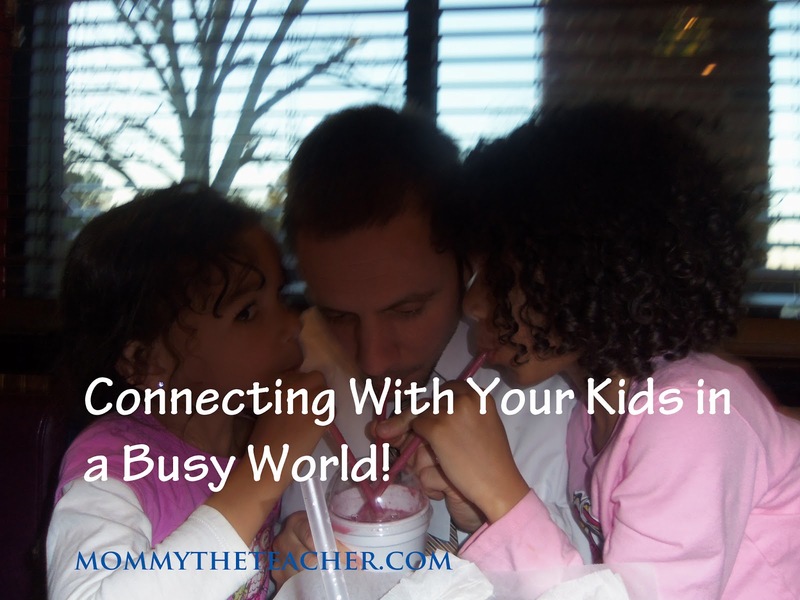 The goal of connecting with your child is for you, but mostly for them. You don't want them to lie down at night having not gotten that "loving feeling" from at least one of you. You don't want them to grow up in a home with things but no love. How many adults have you known who've said, I lived in a house with my parents but I can't tell you one time that I felt their love. That's a tragic upbringing, in my opinion. Especially when there are very small ways that we can reach out to our kids to let them know that they are loved. Granted our world is busier than ever but our one unique job that no one else can do, is to be the loving biological parent to our children. Anyone can fill all of the other shoes we wear...but this is the one job that is unique to you or me and no one else can do it quite like us! I love your idea of Hi Lo Game... a great way of asking about their day, without interrigating. Yes! Thanks for reading and commenting!! I like each one of your ideas. I'm a homeschooling mom with five kids, so I needed this encouragement. Thank you! Thank you for your encouraging comment! Homeschooling 5 is a busy life so I am glad that my post was helpful to you. These are great tips! I agree that even doing chores together is quality time together, plus teaching life skills and showing your kids are valued. Thanks for sharing this list! Way to go girlie' good stuff! Such an encouragement. 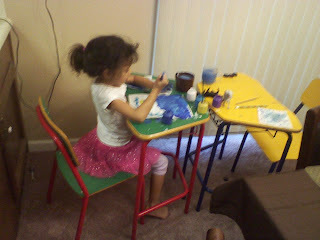 :) My girls are 5 and 7, too, and their absolute favorite stories and songs and games are the ones I create on the spot. This post reminds me of last winter at my house. It was my birthday, both my girls and I had the flu and I had spent all day cleaning up after tummies being upset. Around 7 p.m. I found myself on the couch with both girls in my lap, kissing me and telling me happy birthday and how much they love me, and I think that was the best birthday present I ever received. Not 5 minutes after this, a friend called and wanted to commiserate with me on what a rotten birthday I had had, but I remember tearing up and telling her, "No, my girls are here with me, giving me love, and I couldn't ask for any better." Oh Shannon...that does sound like a special bday! So many times when the family is ill like that...all of the cleaning and spraying and temperature checking seems to go unnoticed. Although we don't do it for that, what an awesome reward with your kids climbing up afterwards and loving on you like that. Thank you so very much for stopping by! When You Think You Can't...Yes You Can! This blog is a personal blog written and edited by me. The reviews are written strictly by me, based on my opinion and the product reviewed unless otherwise stated. I Stephanie Rich, and my contributors, are not paid, unless otherwise stated in the post, for these product reviews, but are given the product as a gift to test and review. The compensation received will never influence the content, topics of posts made in this blog. All advertising is in the form of advertisements generated by a third party ad network. Those advertisements will be identified as paid advertisements. Occasionally, Mommy the Teacher will also conduct advertising campaigns for different brands. Any products or financial compensation received for a campaign will be disclosed in the post. Mommy the Teacher does accept paid advertising if the ad is relevant to the Mommy the Teacher audience. © 2013 All Rights Reserved Blog Posts and Music are the original property of mommytheteacher.com. Simple theme. Powered by Blogger.